A 15 year old Thoroughbred gelding was brought in to the clinic during the early hours of the morning as he had been colicking violently for the last hour. The gelding had no prior history of colic episodes and had been completely normal during the previous day. On arrival at the clinic, the gelding showed exceptional pain and was unresponsive to the analgesics and sedatives given to him. The horse was visibly distressed. He was sweating profusely and had muscle tremors. His heart rate was exceptionally high (termed “tachycardia”), his respiratory rate was increased (termed “tachypnoea”) and his breathing was laboured with nasal flaring. The gums were a dark red – bordering on purple – colour which had what is known as a “toxic rim” or “toxic line” around the gum line. Congested membranes with a toxic rim present on the gum line. Severely congested ocular mucous membranes. 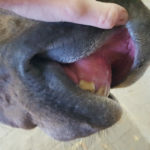 The first thing performed on this horse, after the administration of pain relieving drugs and sedatives in order to be able to work with him, was a nasogastric intubation. Horses are unable to regurgitate, if there is a build-up of reflux (often found with grain overload colic, anterior enteritis and small intestinal pathology), the reflux fluid accumulates within the stomach. The stomach has a capacity of around 12 to 15 litres and if this fluid is not manually removed through the passing of a stomach tube, the capacity of the stomach is exceeded and the stomach could potentially rupture. Spontaneous reflux obtained during nasogastric intubation. For this reason, it is important that nasogastric intubation (stomach tubing) be considered part of a standard colic work-up. No reflux was obtained so a rectal examination was performed. A characteristic feeling of free fluid within the abdomen was felt and this caused the veterinarian to be highly suspicious that a rupture of the gastro-intestinal had already occurred. The veterinarian has a couple of important diagnostic tools which they can use to help determine if rupture has occurred. The use of an ultrasound scanner on the abdomen will help determine whether there is free fluid present within the abdomen. The appearance of the fluid also aids in determining the type and contents of the fluid within the abdomen. Very often, the fluid will have a “speckly” appearance due to the presence of food materials in the leaked free abdominal fluid. The veterinarian will then perform an abdominocentesis on the fluid. An abdominocentesis has been performed and peritoneal fluid is being sampled. Photo credits from: Virginia Maryland College of Veterinary Medicine. This essentially means that a patch on the underbelly is shaved and prepared sterilely. A needle is placed carefully into the abdomen and a sample of the free abdominal fluid is collected. This fluid is evaluated by calculating the number and type of cells present within the fluid. 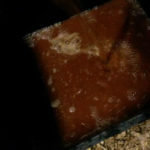 The presence of ingesta (such as small bits of grass) as well as free bacteria in the fluid sample will almost unequivocally mean that rupture has occurred. If a rupture has occurred, the prognosis for survival is hopeless as the abdomen is highly contaminated and peritonitis will inevitably occur. Early signs of Peritonitis already visible. 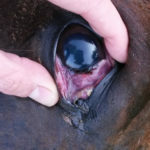 Unfortunately, in this case, the gelding was humanely euthanized on the grounds of rapid deterioration, intractable pain and the presence of food-containing free fluid within the abdomen. On post mortem evaluation, it was found that he had a torsion (or twist) of the large colon and a part of this gut, which had become friable and compromised, had ruptured. On opening the abdomen, free fluid was found to be present – The fluid was blood-tinged and contained food contents. Faecal contents present within the abdomen.